I’ve been a mother for over 13 years. Wow, it is kind of crazy typing that as I wonder where have 13 years gone by? When my oldest daughter Abby was born there were not a lot of innovative products around like there is today. Things were pretty basic. When Hailee was born almost 3 years after Abby cool baby gear was just starting. I remember the swing Hailee had compared to Abby. Abby’s was pretty basic where fast forward 3 years and in came the cradle swings with sounds, lights and moving mobiles. The one thing that hasn’t changed in the 13 years of being a mother is my love for Playtex Baby products. When Abby was a baby I trusted Playtex bottles to feed her and Playtex Diaper Genie to keep her little stinky diapers from smelling up our home. When Hailee was born they had an amazing new line of bottles, Playtex VentAire, they seriously were the best thing ever. They really helped keep gas at bay and reduced the amount of spit up when compared to other bottles I had tried. I loved those bottles so much that when I found out I was expecting Bella I made sure I stocked up on them. Since we use bottles I have also always used the Playtex SmartSpace Drying Rack. It is actually really hard to find products in my home for Bella that are not Playtex! Recently I was contacted by Playtex and asked if I would be interested in reviewing some of their products with Bella and of course my response was a BIG YES! I was pretty excited because many of them were on my list of to-buy as Bella moves into the toddler stage. One of the biggest challenges I think as a parent is the transition from bottle to cup. Bella is a picky child, she absolutely hates milk so she is still on formula as well as solid foods. 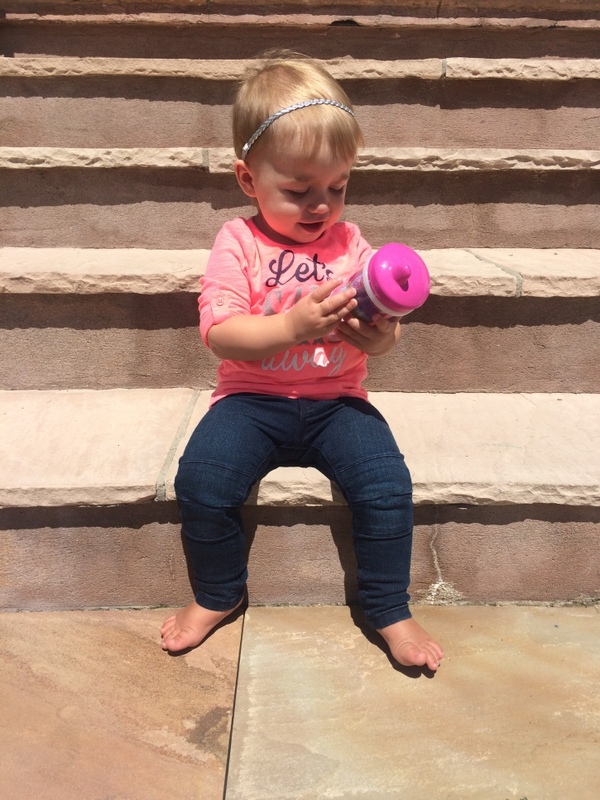 I thought getting her to take a sippy cup would have been a lot harder than it was. The first sippy cup I introduced her to was the Playtex The First Sipster. It has a soft spout which is perfect for those just starting to transition from bottle to cup. She took to it well and loved having water and juice in a big girl cup. I love that they don’t leak. Many cups claim to be spill-proof however I am sure you have encountered a few that didn’t live up to that claim. Thankfully we have not encountered that with these cups and Bella has been using these for a couple months now. Of course with Bella’s many teeth those soft spout cups can only be used for so long before her biting habits will wear them out. Finding a more durable cup for her at this stage was important. We take long car rides every other week when we drop off my older two girls to their father and often go for nice long walks. This meant I needed something insulated to keep her water and juice nice and cold in the summer. I was a little bit worried she wouldn’t adapt to the harder spout but was pleasantly surprised that she figured out she couldn’t just bite on the spout and fluid would come out. 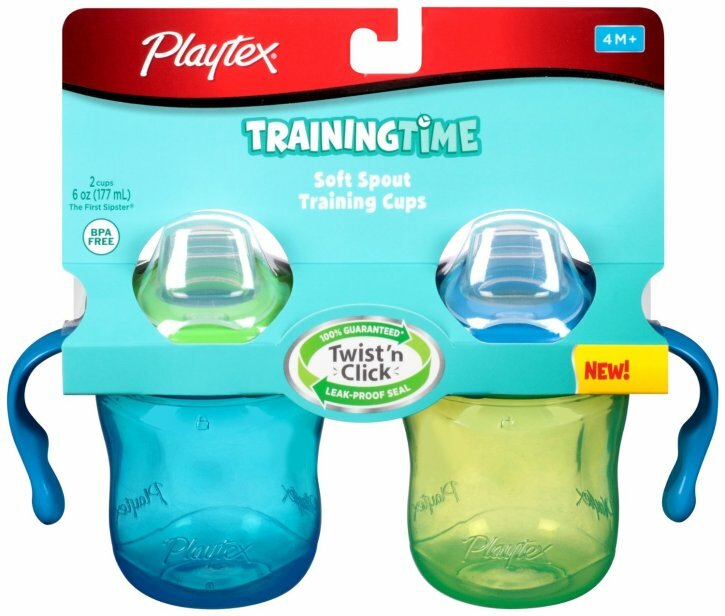 Bella has been using her Playtex Playtime Insulated Spill-Proof Spout Cups for a little over a month now and not one leak. Her juice stays nice and cool and the designs are so cute! They have designs for both boys and girls like My Little Pony, Thomas The Train and many more. Bella enjoys sitting on the porch in the morning with her cup, admiring all the My Little Pony’s! This is definitely a must-have for babes on-the-go to keep their drinks nice and fresh. Hopefully, one day soon, Bella will enjoy milk and these will come even more in handy at keeping her milk from souring in the summer heat. We also had the opportunity to try out some other Playtex Baby Products that I find are essential in making the transition from baby to toddler a lot easier and a lot less messier! 1. Playtex Twist N Click Bowl – These bowls are amazing, I have traveled with applesauce, pasta with lots of sauce, mashed potatoes with gravy and more without a single leak. They are perfect for when we go on day trips so we can close up whatever she has not finished to keep the flies away. 2. 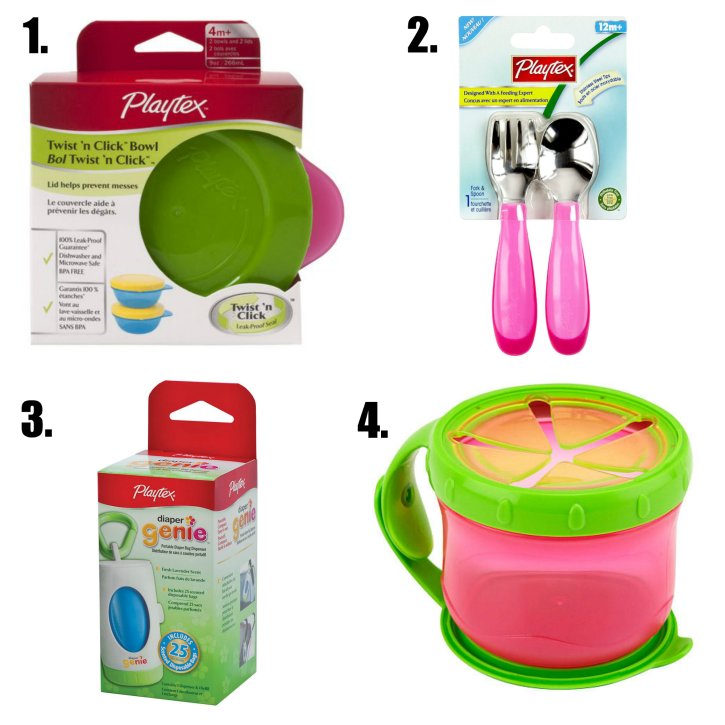 Playtex Toddler Utensils – Bella is not yet feeding herself with utensils, she is much like her father and eats with her hands which for now is fine by me. I do however offer her utensils at every meal and have been working with her to understand how they work. I love the Playtex ones as they are sturdy yet not heavy. They are the perfect size for little hands. 3. Playtex Diaper Genie On the Go Dispenser – I absolutely love that Playtex made the on-the-go Diaper Genie Dispenser. Talk about lifesaver when out at a family members home and your little one does a number two that you would rather not leave with your host. These seal in the stink and with a toddler who is eating solids that stink can sometimes clear and entire room. This was something that wasn’t around with my two older girls but I am so every grateful it has been around for Bella! 4. Playtex Twist N Click Snacker – Bella loves snacks! Grapes, watermelon, peaches, strawberries, goldfish, puffs, you name it and Bella will most likely eat it. 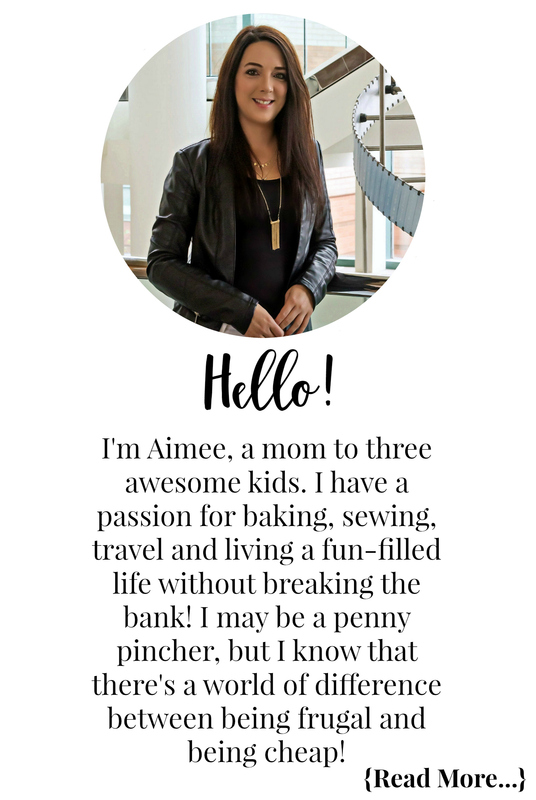 Keeping kids happy while shopping is not the easiest task and I truly prefer to shop solo but that isn’t always possible. I love having our snacker on hand filled with some of Bella’s favourite treats to keep my girl happy while I shop. She also enjoys taking her snacker on the road when we drive the girls to their dads. The only thing at first that surprised me was how stiff the little triangles were that her hand needs to pass by. Thankfully after a few uses they loosened up a bit making it easier for her to get her little hand in for a treat! Stay up-to-date with Playtex Baby on Facebook, Twitter and YouTube. Need some of these products? You can find them on Amazon, Walmart and Babies R Us! Let me know in the comment section below, what is the one baby/toddler product you couldn’t live without? Disclosure: Although this post has been sponsored by Playtex Baby, the opinions and language are all my own, and in no way do they reflect Playtex Baby. Any product claim, statistic, quote or other representation about a product or service should be verified with the manufacturer, company, provider or party in question. « Will You Help VarageSale And First Book Canada Donate Over 30,000 Books To Kids In Need? What a great batch of products. I think we had the same Ventaire bottles when my eldest was a little stinker. Loved this brand and trusted it too. Glad to see they keep innovating and that’s a great picture of Bella. Platex is a brand I know and trust well. I used it for all of my children and loved them!! 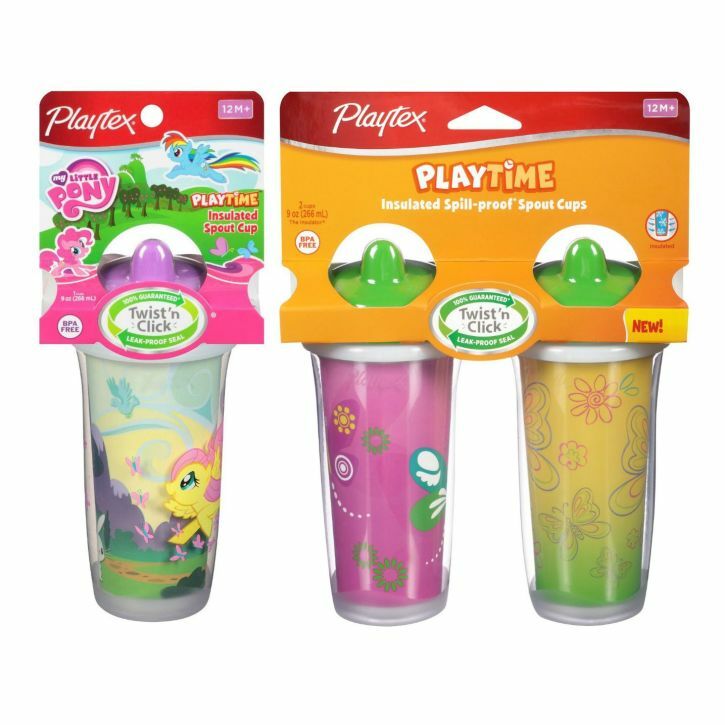 We loved the thermos cups and snack cups from playtex. So good for little ones eating cheerios! We love Playtex Baby here. My son just recently got the Superhero Spill Proof Cups and he now refuses to use any of his other ones. As a grandmother of a super-duper grandson, I love that Playtex has come out with these cups, utensils, and plates. I always keep my eye out for different and unique things for Oliver and these things definitely fit the bill!